AirScout Application was launched in the spring of 2016 and is the only service with a machine capable of applying two different products at the same time to AirScout’s standards using thermal and ADVI imagery. We would like to welcome Shelby County Ag in Shelbyville, Indiana as the latest partner to provide AirScout Application services. We are currently looking for others to expand this important service across the Midwest. Please contact us to learn about franchise opportunities, and how you can merge this with your current application business. With Hindsight, you can finally play against the cards Mother Nature deals you. By using the AirScout Edition Hagie machine to split-apply nitrogen, we’ll feed your plants only what they need, and only when they need it. We treat your field as if it were our own, paying special attention to avoid sensitive areas. Applying nitrogen as close to plant utilization as possible is best practice. We use the 360 Yield Center’s “Y-Drop” for this purpose, as it delivers the essential nutrients close to the roots for quick utilization. This can be done by flat rate, variable rate, or our Hindsight program. This is likely the biggest change you can make to minimize cost and increase yield. 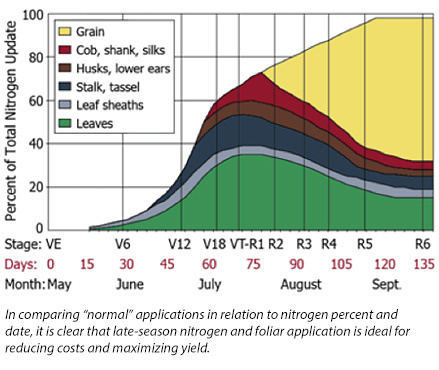 By reducing your early-season nitrogen application and saving it for later, you can either use it at the optimum time and location to maximize yields, or save those dollars completely. We offer cover crop interseeding with our specialized machine, the AirScout Edition Hagie. If you have AirScout imagery, we can build a prescription cover crop seeding map based on your soil zones to give you the best stand possible. You can’t pick up a farm magazine or paper these days without reading about the benefits of cover crops. But most articles forget that you must consider your chemical program first. Herbicide residual activity or carryover can potentially kill any type of cover crop you plant, so you must choose carefully. If you’re interested in planting cover crops, the first thing you need to decide is what you want them to do—be it nutrient scavenging, erosion control, adding organic matter, or better soil tilth. Next, you have to find the right cover for your goal and decide when it should be planted. The growing season in the northern half of the U.S. tends to be too short for an after-harvest seeding, so it’s best to plan accordingly. If you choose to interseed a cover crop, you must also decide if you want to plant it before crop canopy or near crop maturity. Our AirScout Edition Hagie machine, available through AirScout Application, allows cover crop seeding where it matters most, keeping your herbicide program, product, and goal in mind. 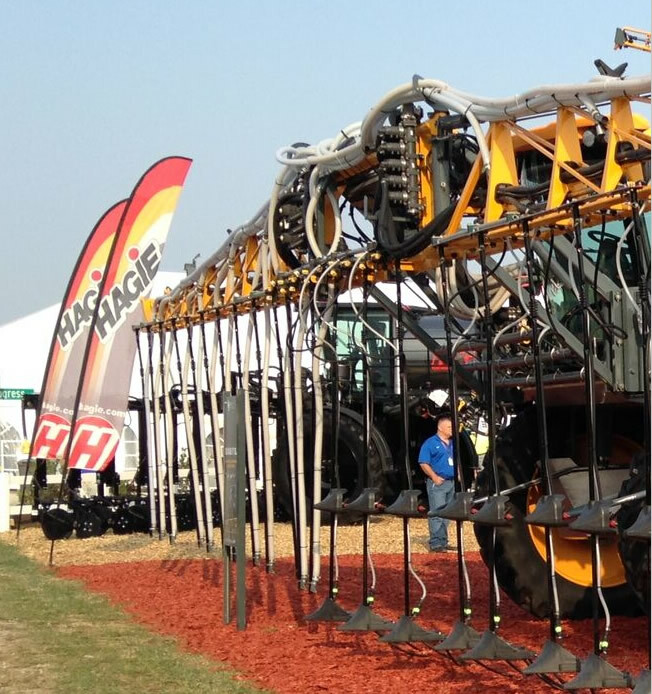 AirScout partnered with Hagie to create a machine capable of applying two different products at the same time, both at prescription-based variable rates. The AirScout Edition of the Hagie STS16 Sprayer uses AirScout Thermal™ and ADVI™ imagery and uses AirScout online tools to build precise prescription maps which communicate directly with the Hagie machine. 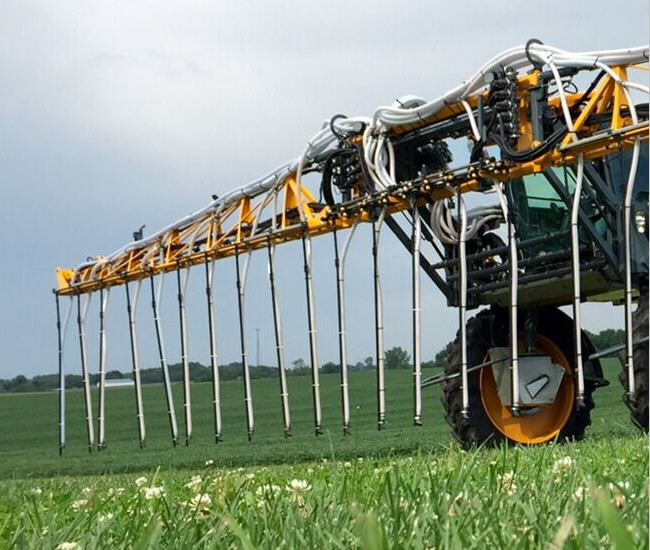 So be it nitrogen and foliar products, or interseed cover crops, the Hagie can go through any size crop to apply specifically tailored products with an unprecedented level of insight and efficiency.